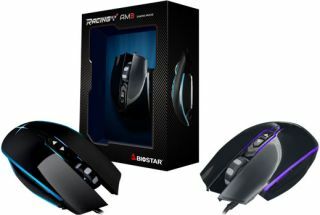 It didn't take long for Biostar to expand its gaming mouse lineup with a second rodent. The company released its first mouse, the feature thin AM2, back in September for $10 and now it has a second model that is a bit more flashy. The new AM3 wiggles into Biostar's Racing line of products. Like the AM2, it targets gamers on a budget, though it costs a little more at $16. That's still a drop in the bucket compared to many gaming mice on the market. Biostar equipped the AM3 with a "high-precision" PMW 3320 5,000 DPI sensor. Users can adjust the sensor to four different levels of sensitivity—800 DPI, 1,200 DPI, 2,400 DPI, and 5,000 DPI. Higher end mice offer a wider range of sensitivity, but for $16 it's hard to complain here. The mouse buttons on the AM3 use Huano switches that Biostar says are good for 10 million clicks. It's an ambidextrous mouse fit for both left-handed and right-handed users, and shaped to accommodate the claw grip style. Biostar opted against the rubberized finish that is popular in many of today's mice and instead went with a high-gloss UV surface. Underneath are large teflon feet for smooth gliding. Other specs include a 5,300 fps framerate, 80 ips tracking speed, and 1.8 meter braided cable. The AM3 measures 122x67x34mm (LxWxH) and weighs 149g (non-adjustable). Biostar did not say when the AM3 will be available to purchase, only that it will retail for $16 MSRP. Maybe they'll release an AM4 model in time for Ryzen?